The first phase of the Icknield Port Loop scheme in Birmingham is underway with the arrival of the first modular properties at the development. 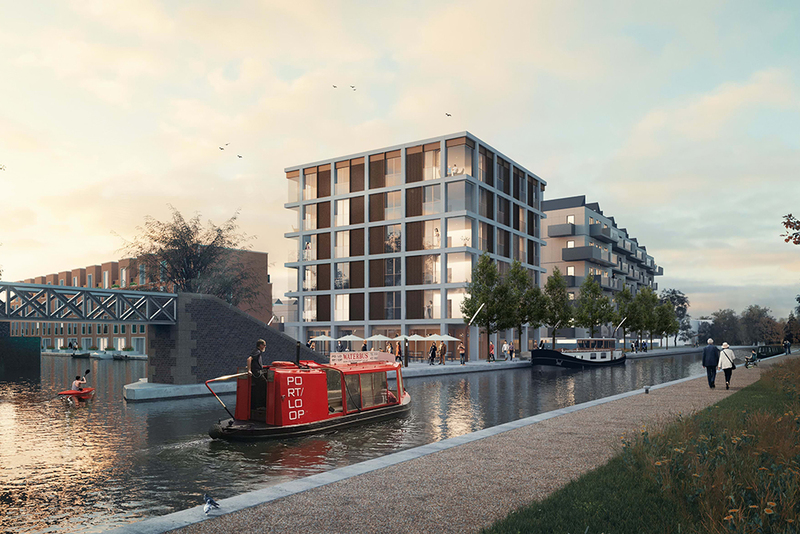 The half-mile canal loop is within walking distance of the city centre and will provide a mix of 77 modular, factory built and traditionally constructed homes on this large brownfield site. Homes England agreed a £7.45million loan from the government’s Home Building Fund for the development by Urban Splash and Places for People. The longstanding venture between the two regeneration companies encompasses plans for more than 3000 homes and will deliver phase 1 at Port Loop. The scheme will see the development of 1,150 new homes along with commercial property and community facilities across the 43-acre site. This first phase will include a new park, improved canal towpath and 77 homes built around shared gardens. In addition to the 37 traditionally built properties, there will be 40 modular homes, which can be customised by customers. Adam Willetts, speaking on behalf of the partnership, said: “Port Loop is one of the most exciting regeneration developments in the country and we are delighted to be delivering the first of many homes there. Places for People and Urban Splash are working in partnership with the original landowners, Birmingham City Council and Canal & Rivers Trust on the wider scheme. The Communities Secretary, Rt Hon James Brokenshire MP, added: “This government is committed to making the dream of home ownership a reality for a new generation as we power through to delivering 300,000 homes a year by the mid-2020s.